SPB Software has announced the release of SPB Wireless Monitor for Android platform – a complete Android solution for measuring data traffic via all types of connections and calculating network usage costs according to the current data plan. One day you may realize that you do not control your spending on mobile Internet. It even can become dramatically expensive and subjected to the high costs of roaming. Astonished by the unforeseen expenses you try to find out what’s going on. Your search comes to no avail since there is no easy way to track which particular applications your money is being spent on. You finally decide to stop using the Internet on your mobile device in order to prevent bankruptcy. There is a way out: by installing SPB Wireless Monitor to your mobile device, you will be able to calculate how much money you spend on the Internet and determine which applications are consuming the most of your money. SPB Wireless Monitor prevents unwanted mobile service charges and gives subscribers control over their mobile data spending. SPB Wireless Monitor measures data traffic, calculates network charges according to the currently used tariff, sends warnings of costly data usage, and reports the specific data traffic each application generates. It supports various types of connection (CDMA, GPRS, 3G, and Wi-Fi) and provides users with the report on traffic per application allowing them to track the applications that are the most data consuming. The home screen widget provides fast access to the data traffic information. SPB Wireless Monitor is compatible with Android 2.1 and higher. It is available for 9.95 USD from Android Market in the Tools category. 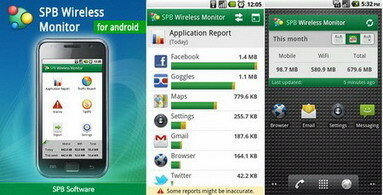 0 comments on "SPB Wireless Monitor for Android lets you identify the most data consuming apps"